The word “alopecia” derived from the Greek “Alopex” for “fox.” Foxes are less furry when affected with a skin disease (the “mange”) which causes them to lose their hair. When a fancier word for “baldness” was sought, the mangy fox supplied it — “alopecia” or, if you wish, “fox-mange” — not a very positive image to associate with baldness. Alopecia is the medical term for hair loss. There are many types of hair loss with different symptoms and causes. ANDROGENIC ALOPECIA– Androgenic alopecia is a common form of hair loss in both men and women. This condition is also known as male-pattern baldness or female pattern baldness. In this condition, hair loss is in a well-defined pattern. 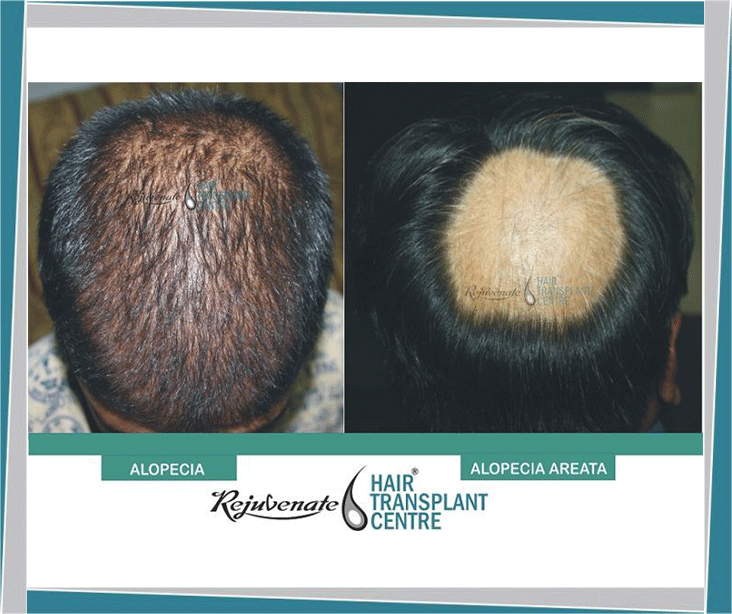 ALOPECIA TOTALIS– Alopecia total an auto-immune disorder and results in total loss of hairs on the scalp. However, Alopecia Totalis can affect nails as well as hair, causing them to become thin, brittle and ridged. It does not induce pain or sickness and the quality of life for sufferers is generally not affected, except by the psychological implications that accompany any form of hair loss. ALOPECIA UNIVERSALIS– Alopecia Universalis is a condition characterized by the complete loss of hair on the scalp and whole body including eyebrows and eyelashes. It is an advanced form of alopecia areata. Although the exact cause of Alopecia Universalis is unknown. Alopecia Universalis can occur at any age, an autoimmune disorder, in which a person’s immune system attacks the hair follicles. Genetic factors may contribute to AU as approximately 20% of those affected have a family member with alopecia. TRACTION ALOPECIA– Traction alopecia is a form of acquired hair loss that results from prolonged or repetitive tension on the scalp hair. It is a condition that is the constant force applied to hair. Eg.hair loss along the hairline due to prolonged wearing of tight ponytails. The thinning could be attributed to the start of androgenetic alopecia. SCARRING ALOPECIA- The term “scarring alopecia” refers to a diverse group of rare disorders that destroy the hair follicle, replace it with scar tissue, and cause permanent hair loss. The clinical course is highly variable and unpredictable.The inflammation that destroys the follicle is below the skin surface and there is usually no “scar” seen on the scalp. Scarring alopecia occurs in otherwise healthy men and women of all ages, is not contagious, not hereditary and is seen worldwide. TELOGEN EFFLUVIUM– Telogen is the name for the resting stage of the hair growth cycle. A telogen effluvium is when some physical stress causes hair roots to be pushed prematurely into the resting state. Telogen effluvium can be acute or chronic. Reasons:-The common causes of telogen effluvium are high fevers, childbirth, severe infections, severe chronic illness, severe psychological stress, major surgery or illnesses, over or underactive thyroid gland, crash diets with inadequate protein, and a variety of medications. Most hair loss from medications is this type and causes include retinoid, beta blockers, calcium channel blockers, antidepressants, and NSAIDS (including ibuprofen). If there is some “shock to the system”, as many as 70% of the scalp hairs are then shed in large numbers about 2 months after the “shock”. This sudden increase in hair loss, usually described as the hair coming out in handfuls, is acute telogen effluvium. ANAGEN EFFLUVIUM- Anagen effluvium is an extensive hair loss caused by sudden profound disturbances in the matrix cells of the hair follicles. Rather than shedding, the hair is lost by the fracturing of the hair shafts at the level of the scalp. The two most common causes of anagen effluvium occur from cancer chemotherapy and from radiation therapy. There is other causes of anagen hair loss, e.g. trichotillomania (compulsive hair pulling), poisoning from toxic plants, loose anagen syndrome, certain disease states (e.g. pemphigus, discoid lupus erythematosus etc. ), heavy metal intoxication, etc.